I am going to assume that majority of you were sitting in the same position as I was just not too long ago. Whether you’re a freshman who just recently went through this, or a senior who did four years ago, many of us had to sit down and consider the transition from high school to college. One big thing I had to consider was the difference in class size. The only debate that occu rred in my mind concerning coming to Penn State University was that I would now be getting an education with around four hundred students sitting in the room with me, whereas in high school there were only twenty-five. Not being able to have a special bond with my professor like I did in high school and fearing that I was going to have a hard time staying focused in class was a big factor in where I was going to come to college. A problem that I face every day in my lecture classes has to do with me struggling to stay focused and paying careful attention to my professors and whatever their teaching, even when I think I am paying attention. Although it is in my control of whether I use my phone during class or talking to my friends, it is evident that in a lecture class it is not easy to get in trouble. While being on my phone or distracted from other things going on in the lecture hall it affects me completely. Information process modeling is an analogy that demonstrates that our brain can we viewed and understood the exact way a computer is. Our brain starts off with encoding information that stems from our senses to then be sent to a “storage compartment”. After that, the information that has been understood is now stored for our long and short-term memory. Once this is complete, our information that we have learned and understood has the capability of being retrieved later on. 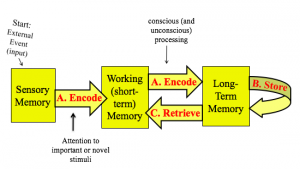 However, during this whole process our attention has to do with the encoding part of memory. During encoding, the key and most important part is making your first memory and without attention it is unable to be retrieved later on. With fail of paying attention it is impossible for whatever you’re learning about to be sent to your short-term memory which makes it impossible to be further sent to your long-term memory. You may be wondering where I am going with this but, without information being sent to our long-term memory we are unable to process information that we learn in class that is perhaps crucial to know for an exam. Making the decision to come to Penn State University I have the opportunity to face and go through many things. 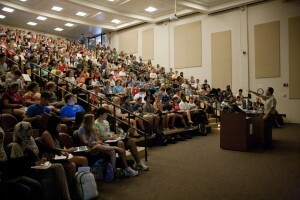 I’m going to be honest, my fear of struggling in a class of around four hundred students quickly became a reality when I first started classes here however, I have learned to put my phone away and save my conversations for later to make sure my attention is completely on my professor.